Executive summary: What's My Name? Other cities often stated as his place of birth include Baltimore, Yonkers, New York City, or Philadelphia. His 2002 autobiography starts with the words, "My name is Earl Simmons. I was born December 18, 1970 in Mount Vernon, New York, the first and only child of Arnett Simons and Joe Barker." Simmons was raised in Yonkers, New York. Raised a Jehovah's Witness: "Before that I actually liked Jehovah's Witness as a kid. Ladies that my mother would get to baby-sit my sister and me would always take us to the different churches they went to, so I had experience with many kinds of religions growing up, but my mother said she liked the structure of Jehovah's Witness for us kids and I always enjoyed it when she took us to the local Kingdom Hall for service. I remember the little gold books of Bible stories they gave out and I used to read The Watchtower magazine a lot." E.A.R.L. 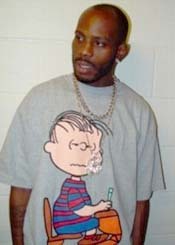 : The Autobiography of DMX, p. 10.